Ayodele Elegba, founder of the Lagos Comic Con recently announced a mouth-watering opportunity for not one, but thirty (30) comic book creators across Africa! Alright, guys. I am tired of young creators hustling and struggling without moving forward with their ideas. If you are already in any studio or busy with a comic currently please don’t bother. This is for those who have free time and can deliver. Can’t talk much about the outcome except to the lucky 30 I will be picking! Good luck! Writers: Send something you have written that includes action and dialogue. Not more than 5 pages. Violate this and you’re automatically snubbed. 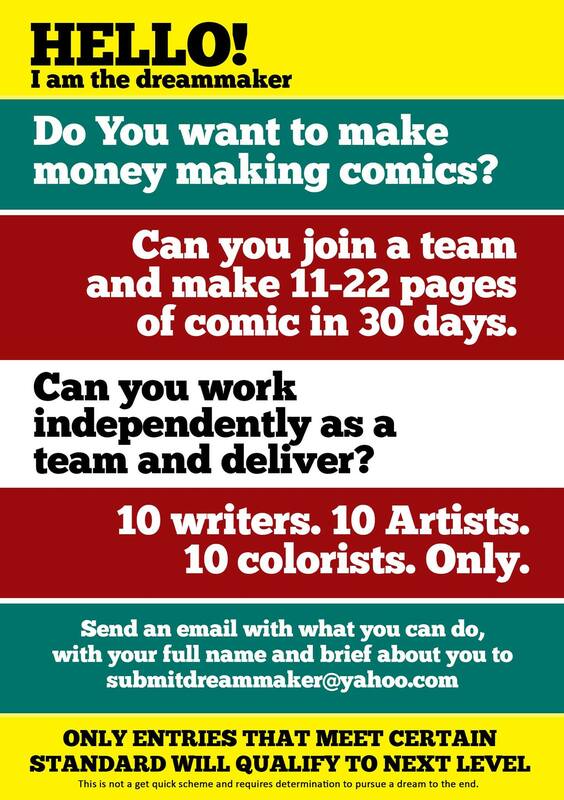 Artists (pencilers and inkers): Send a drawn comic page with at least 5 panels. Not coloured, but inked. Colourists: Send a coloured comic page with at least 5 panels. You can use someone else’s art that can inspire your colours. I am trying to raise the next set of comic creators and maybe help them to publish comic books next year. It’s a sort of meditation, mentorship, but it’s also a business. The opportunity is open to all Africans. Elegba mentions that he’ll love to see a writer in Ghana work with a Nigerian inker/penciler and then finalized by a colourist in Zambia; essentially, a continental powerhouse of African stories. Successful creatives will be formed into a team to produce any comic of their choice with Ayodele Elegba at the helm. Elegba will serve as the editor and perhaps, just perhaps, invest in making your comic books profitable. Most importantly, however, only candidates that meet a particular (undisclosed) standard will be responded to. With this initiative, I agree with Ayodele that the next set of creators are about to be born. UPDATE: Deadline for application is December 15, 2017. Do you have it in you to create the next wave of awesome African stories? Go over the criteria then shoot an email to submitdreammaker@yahoo.com asap. All the best! Ayodele Elegba is the founder of the Lagos Comic Con, Spoof Animation Studios, author of Dark Edge, Central Attack and the 13 issue deep African comic, Strike Guard among others.